Advanced Systems is located in central Halifax, Nova Scotia, Canada. We provide rental and full service production for conferences, conventions, meetings, awards shows, special events, and receptions. People. Programs. Presence We help you with the everyday needs in these areas. We demystify the land of online marketing - email marketing, blogging, social media, lead magnets, lead generation and help you understand how it can all work to your advantage. WeUsThem is a full service end-to-end Marketing, Advertising, Communication and PR agency handling all your needs in a global context. A.P. Reid Insurance is one of Canada’s fastest growing brokers of personal and commercial insurance solutions. $200 Discount on the Well Researched Doc. Green junk removers with excellent customer service. Well get rid of junk, yard or construction debris, almost anything. Full (we load) or self (you load) service. Free estimates, excellent prices. 10% discount on implant dental lab fees for Chamber members. Masters Dental Specialty Lab As Masters-level dental technology professionals, we aim for solutions. We will collaborate with you to deliver on the common goal of meeting your patient’s oral needs. Bookkeeping, Accounting Tax and Consulting Services- We will provide a free consultation, and 25% off any services we provide your company. 50% off for Chamber Members! All Halifax Chamber of Commerce members receive 15% off regular priced single float sessions. Seventy-five minutes of relaxing pure bliss await you! The Floatation Centre is a springboard for happiness and elevated levels of consciousness! 10% Discount on single training course or 15% discount on three or more courses! Looking for ways to reward your staff? Want to treat your clients to a night out? Need a setting for your upcoming family reunion? Make the Royal Nova Scotia International Tattoo your destination! GROUP TICKETS - Book Now, Pay Later! Book your seats now with no obligation to pay or confirm your attendance numbers until May 31, 2019! Special rates apply to groups with a minimum of 25 people. Visit https://nstattoo.ca/tickets/group-tours/ to learn more. 15% off for Chamber Members, 25% off for non-profits! 40% OFF Corporate Chair Massage Event! 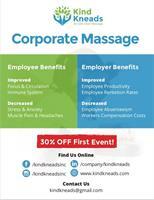 Get a total of 40% OFF your first on-site corporate chair massage event in Halifax this spring with Kind Kneads Inc! reachAbility, in partnership with The Westin Nova Scotian, the NS Accessibility Directorate, and the Halifax Partnership, is thrilled to present this opportunity to Chamber of Commerce Members. Discover the benefits, importance and ease of inclusion from industry leader in accessibility, Mark Wafer. Mark believes there is a clear and compelling business case for real inclusion in our workforce. He is passionate about sharing his expertise and the significance of a comprehensive and diverse labour market.